Sends incoming messages to multiple destinations. This is the base class for all internal nodes of the plumbing lattice. Definition at line 667 of file Message.h. Definition at line 674 of file Message.h. Definition at line 677 of file Message.h. 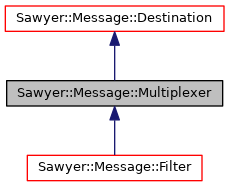 Bakes message properties according to the plumbing lattice. The given message properties are applied to the plumbing lattice rooted at this Destination, adjusted according to the default and override properties at this node of the lattice and all lower nodes. The property values at the bottom nodes of the lattice are appended to the baked argument. Thread safety: All implementations must be thread-safe. Adds a child node to this node of the lattice. An std::runtime_error is thrown if the addition of this child would cause the lattice to become malformed by having a cycle. Thread safety: This method is not thread-safe. Removes the specified child from this node of the lattice. Thread safety: This method is thread-safe. Add a child nodes to this node of the lattice and returns this node. It is often more convenient to call this method instead of addDestination.